Commonly used on Server Condiment Pump models such as 05000, 81263, 81288, 81289, 83430, 86342, 88000, 88010, 88020, 88180, 88190, 88349, BP-1 and where applicable. The Server Express system dispenses from a 11⁄2 gallon (or 6 L) pouch with 16 mm fitment. Features a surgical-quality plastic pump that is quick to break down, dishwasher safe and achieves up to 98% evacuation. 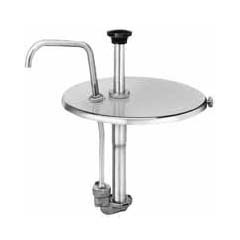 Stainless steel shroud with lid is designed for countertop use. The Express pump has a special connector that pierces the pouch fitment creating a sealed system for maximum evacuation and savings. A full portion yields 1 oz (30 mL) which can be reduced in 1⁄4 oz (7 mL) increments simply by adjusting the portion pin position on the lid lever. Commonly used on Server models 7020, 80140 (FSPWI-SS), 80580 (HSSW-SS), 81140 (FSPW-SS), 82000, 82060, 85050, 85070, 85080, 86510 (FSP-SS), 86520 (BS-SS), 86540 (BSW-SS), 86560 (BSWI-SS), 86600 (HSSWI-SS), 94000 (CSM), 94070 (MMS), 94090 (ECH), 94120 (DICSM), FSPW1-SS and where part is applicable. O-RING FOR DISCHARGE TUBE - 1"
Use on all new style models. BCS/81520, BPI/88000, BS/06110, CP-G-110MM/83120, CP-G-120MM/83110, CP-G-89MM/83130, CPF/83330, CPSSF/67540, CPSSL-FL/67570, CPSSL/67020, CPSSR/67030, CP1/3/83430, CP1/4/83420, CP1/6/83400, CP10/83000, CP101/2/83240, CP200/83300, CP5/83920, CP61/2/83200, CP81/2/83220, CSM/94010, CSMDI/94100, FSPW, FSPWI, FP-DI/82990, FP/82070, FPV-DI/82520, FPV/82120, FSP/82065, FSPFSPW/81320, HSSW/80090, L-NCS/81320, LBS/06110, LFSP/81320, LHSSW/81660, MMS/94080, SP/82000, SP81/2/82980, LNCSW and where part is applicable. O-RING FOR VALVE BODY, 1-5/16"
Use on all new style Server condiment pumps; 7020, 81320, 82000, 82060, 82812, 83330, 83430, 85340, CP-10, CP-8-1-2, CP-F, FP-V and where part is applicable. Commonly used on Server models such as 79890 (SB-2), 79950 (SB-2DI), 83330, 83700 (SB-4), 83720 (SB-4DI), 83860 (SB-3DI) and where applicable. Used on various Server models such as 7020, 81320, 82000, 82100, 85050, 85340, 88000, 88010, 88020, 88180, CP-10, CP-8-1-2, FP-V and where part is applicable. Use on various Server models such as CP-F, FP, FP-DI, FP-V & FP-V-DI and where part is applicable. Use for PD126394 Plug to cover adjustment hole.